The church is a modern building, consecrated in November 1956 and converted from a multi-purpose hall. This article goes into a lot of detail on the specifics. I visited during Lent, and so purple shrouds were over the tabernacle and much of the decoration. The service was taken by a priest in purple and gold vestments, assisted by two altar servers in plain white cassocks. The first two Bible readings were read by people from the congregation, and some others helped to administer communion. The congregation numbered roughly one hundred people, with a rough balance between men and women. There were people of all ages there, as well as a few families. Although the congregation was mainly white, there were several people of an ethnic minority. Unfortunately, I’ve got to say that I didn’t find the congregation to be very welcoming; not a single person said anything to me either before or after the service, and there was nobody at the door giving out the books one needed to follow the service. I attended the Sunday morning 10 am Mass. This followed the Pauline Mass or Ordinary Form structure, observed by the majority of Roman Catholic churches. After an opening hymn and prayers of penitence (but no Gloria, it being Lent), there were Bible readings: Ezekiel 37:12-14, Psalm 129 (sung responsively), Romans 8:8-11, and John 11:1-45. Incense was burned during the Gospel reading, the length of which resulted in much of the church becoming rather cloudy for a while! After the readings came the sermon, given by the priest. He focused on the Gospel reading – the raising of Lazarus – and reflected both on how death and suffering can sometimes increase our faith, and on the challenge (11:26) to believe in the resurrection. Thereafter followed communion, preceded by prayers (including the Lord’s Prayer) and the Creed. The Sanctus (“Holy, Holy, Holy Lord…”) was sung, accompanied by a guitar. Members of the congregation (extraordinary ministers) helped the priest to administer communion. After communion, the priest blessed the congregation and read out some notices. He then processed to the entrance of the church while a hymn was sung. After the service, a lot of the congregation stayed behind for a few minutes to pray in the emptying church. 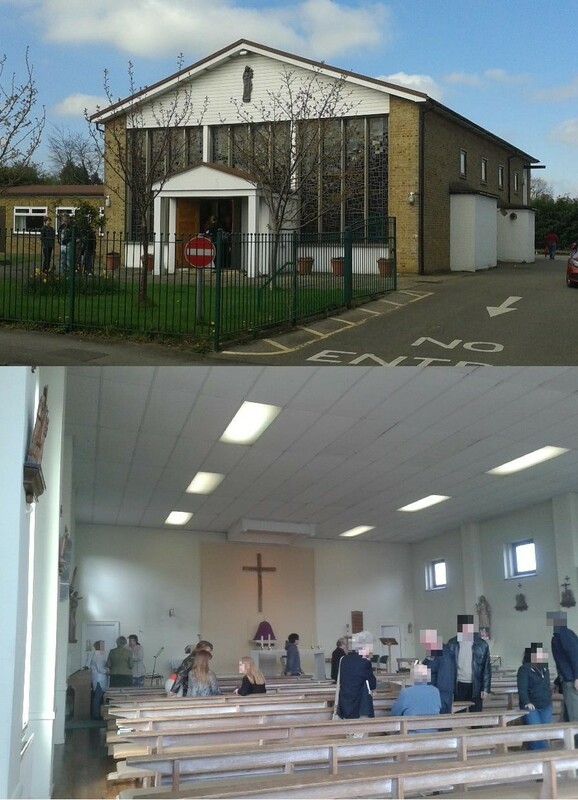 The priest waited by the door to say goodbye to those leaving, and refreshments were served in an adjacent church hall.